We've been watching a lot of live music DVDs lately around here. I've never been the type to get 'homesick', but watching these shows on TV instead of being there makes me feel my very own version of what I think homesick is. Because there is a vast (ocean-space-football field) difference between watching music on a screen and sitting in a great big cloud of it with the bass running up your spine. 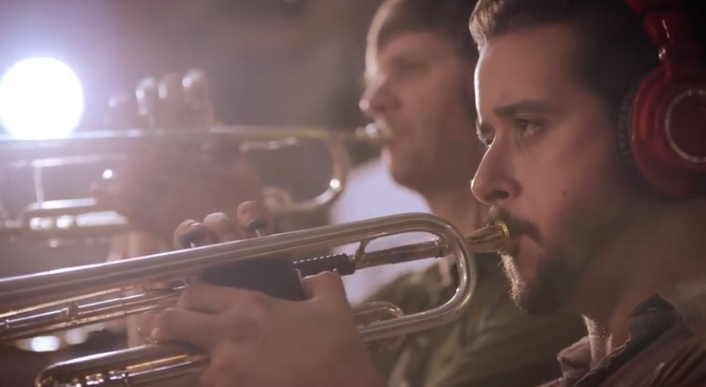 We went over to some friends' house a couple nights ago to watch this one that was filmed in the Netherlands by a band called Snarky Puppy, a collective of a dozen or so completely brilliant musicians who play jazz/funk/world music. The show was recorded in front of a studio audience with music that had been composed the weekend before the recording. It was pretty magical, and I was crawly-skinned-itchy-brained-jealous of each and every person in the audience, every musician and camera person and sound technician. I slumped into the passenger seat on the way home and wished on every single star I saw that Barclay would just drive right past our house and all the way to a little jazz club in New York so I could have some cheesecake and live music. But guess what? Apparently Jimminy Cricket was full of beans because when you wish upon a star your dreams don't come true, you just go straight home and right to bed. Thanks, Walt. Summer, however, is almost here and with it will come outdoor music festivals and concerts on the plaza and maybe even some cheesecake. Until then, you should click the links below and listen to these songs which, for whatever reason, are not embeddable on my blog. Catch this fever.